We’re reading a lot about the dangers of heat waves and drought. Aon Benfield’s latest Global Catastrophe Recap report highlights the exceptional heat wave that impacted India from May 21-31, killing at least 2,500. 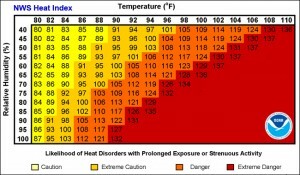 This is one of the highest death tolls on record for heat-related casualties, Aon notes. 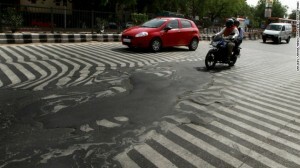 The states of Andhra Pradesh, Telangana, and Odisha (Orissa) were worst affected by temperatures that reached 48.0ËšC (118ËšF) in several areas. 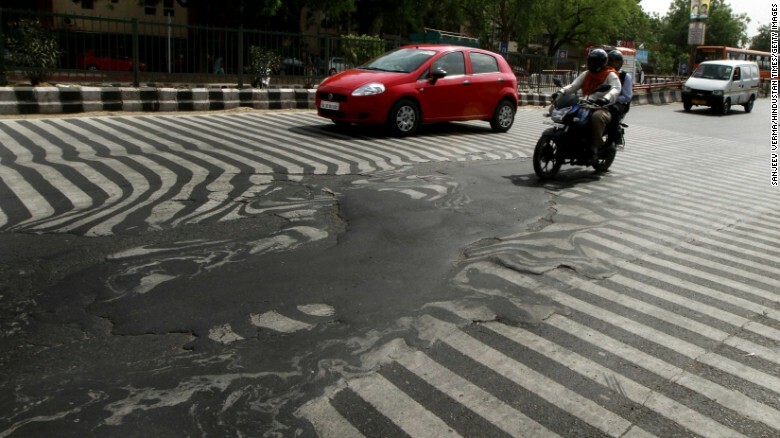 Temperatures were so hot that roads literally melted in some areas. An opinion piece in the New York Times over the weekend spoke more to the deadly risks of heat and humidity. 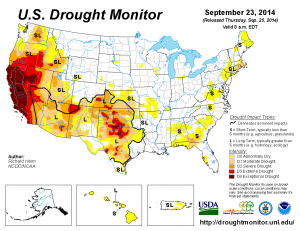 Closer to home the ongoing severe drought conditions across much of the Western United States, with a particular emphasis on California, continue to exact an economic toll. Aon cites a study conducted by the UC Davis Center for Watershed Sciences on behalf of the California state government that concluded that total 2015 statewide economic losses from the drought will top $2.7 billion. Including damage from neighboring states, the overall total loss will rise to at least $3 billion. Heat waves and drought can cause losses in many lines of insurance, according to Munich Re. Many losses are unseen, and the result of secondary events, making it difficult to assess the extent of losses involved. 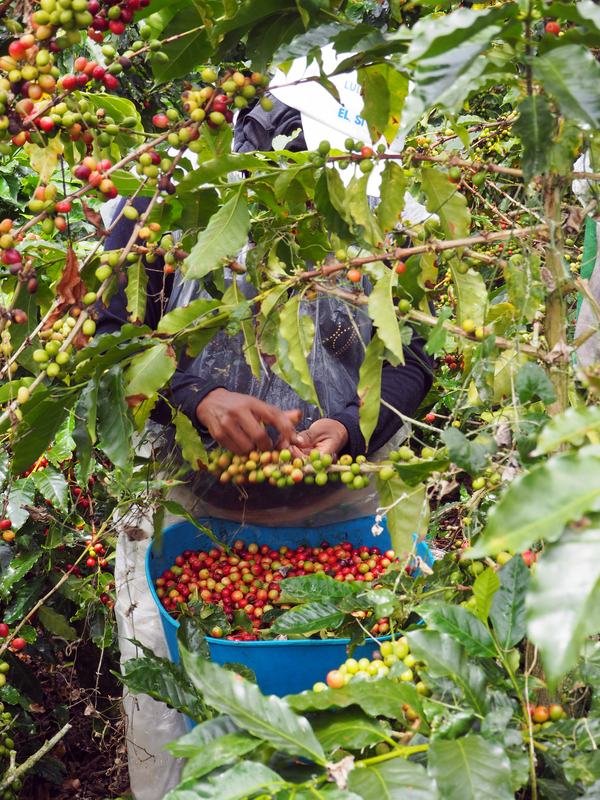 For example, losses to the agriculture industry can run into the billions of dollars in drought years as harvest failures lead to multi-peril crop insurance claims and livestock losses may result from shortage of feed and heat-related stress. Long dry periods also create ideal conditions for promoting the outbreak and spread of wildfires. In 2011 Texas suffered a severe drought and overall and insured wildfire losses in that state were also the highest ever recorded, Munich Re explains. 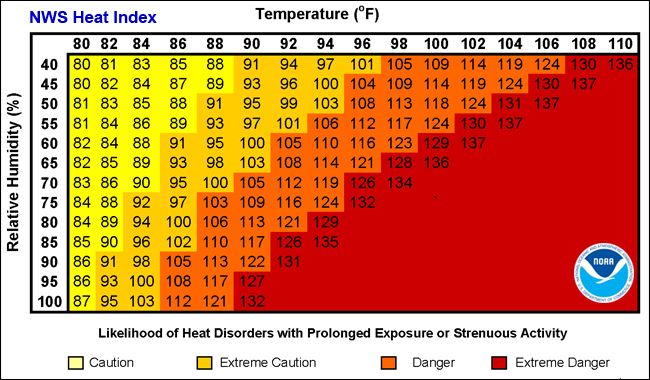 Heat waves have also been linked to an increased risk of mortality and heat-related stress with the potential to impact health and life insurance. I.I.I. provides facts and statistics on droughts and heat waves here and a useful backgrounder on crop insurance here. Nearly 37 percent of the United States and more than 98 percent of the state of California is in some form of drought, according to the latest U.S. Drought Monitor. Its weekly update shows that more than 44 percent of California is now in a state of exceptional drought, with little relief in sight. 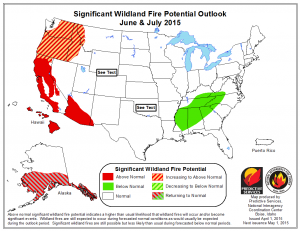 What could this mean for wildfire season? The April 1 Outlook issued by the National Interagency Fire Center warned that parts of California will likely see increased wildfire activity earlier than usual thanks to the effects of the long-term drought. 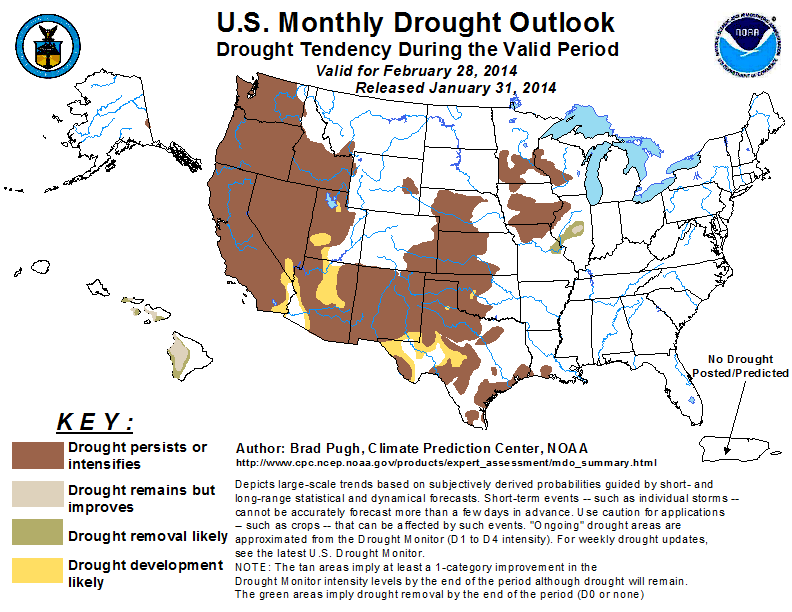 Meanwhile, the National Oceanic and Atmospheric Administration’s (NOAA) recently issued Spring Outlook calls for drought conditions to persist in California, Nevada and Oregon through June with the onset of the dry season in April. I.I.I. facts and statistics on wildfires and insurance are available here. 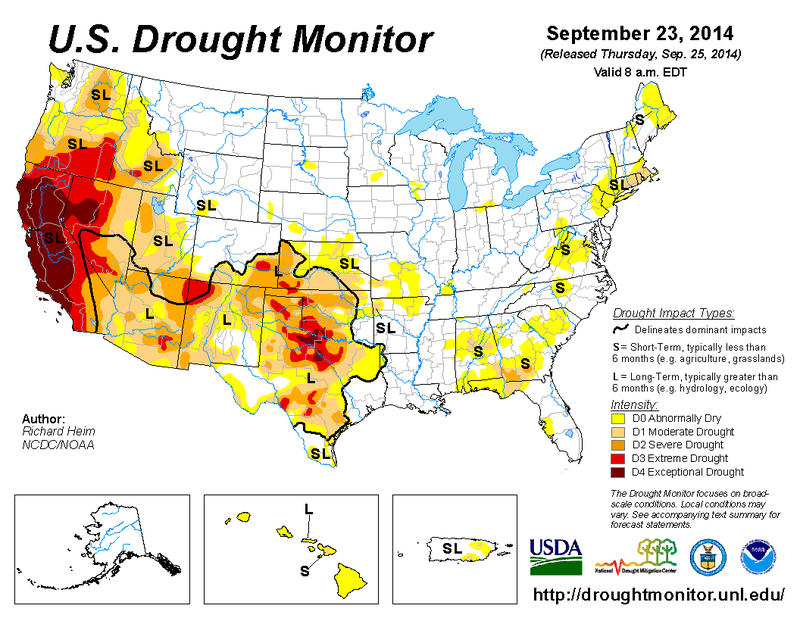 Drought continues to make the headlines, with the latest U.S. Drought Monitor showing moderate to exceptional drought covers 30.6 percent of the contiguous United States. Its weekly update also shows that 82 percent of the state of California is in a state of extreme or exceptional drought. Reservoir levels in the state continued to decline, and groundwater wells continued to go dry, the U.S. Drought Monitor says. The LA Times reports that California’s historic drought has 14 communities on the brink of waterlessness. It quotes Tim Quinn, executive director of the Association of California Water Agencies, saying that communities that have made the list are often small and isolated and have relied on a single source of water without backup sources. However, Quinn also tells the LA Times that if the drought continues, larger communities could face their own significant problems. A recent article at CFO.com by Lauren Kelley Koopman, a director in PwC’s Sustainable Business Solutions practice, makes the point that when water-related disruptions affect operations, companies can suffer significant profit and losses and pay higher prices for goods in the supply chain. Water management issues pose significant operational, regulatory and reputational risks to companies, the article noted. And a recent report from the University of California found that farmers had spent an extra $500m in pumping extra water to cope with the state’s drought, while the total economic cost to the state’s agricultural industry reached $2.2bn. 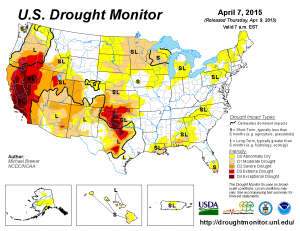 For insurers, droughts can be costly. Drought, wildfires and heat waves caused 29 deaths and $385 million in insured losses in the U.S. in 2013, according to Munich Re. In 2012, drought in various parts of the U.S. caused $15 billion to $17 billion in insured losses, making it the second costliest disaster after Hurricane Sandy. 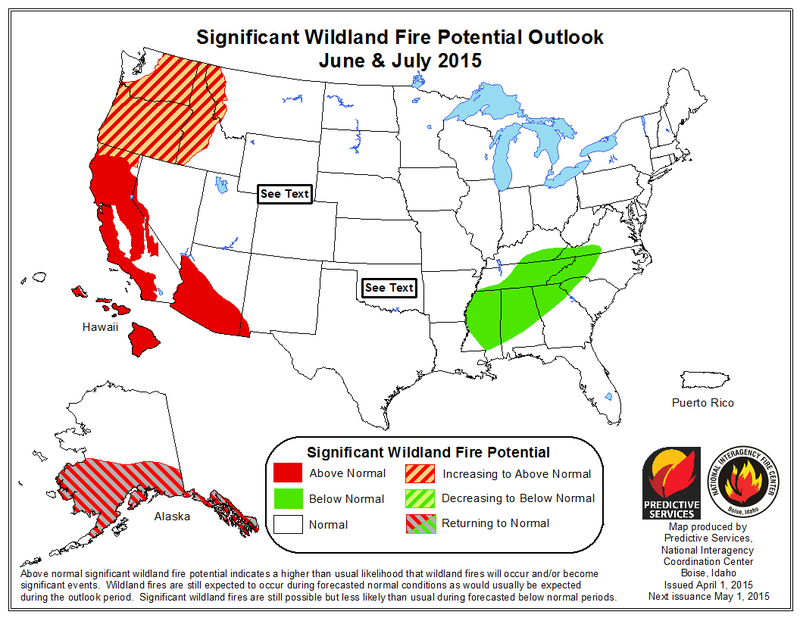 ItÃ¢â‚¬â„¢s mid-July and for many parts of the United States this means persistent hot and dry weather increases the risk of wildfires. 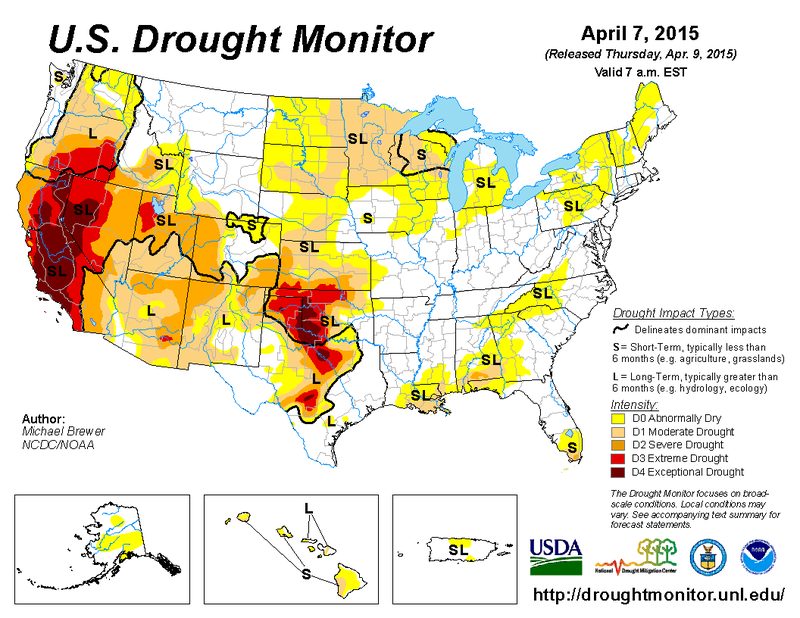 Some 46 percent of the contiguous United States is currently experiencing moderate to exceptional drought conditions, according to TuesdayÃ¢â‚¬â„¢s report from the U.S. Drought Monitor. The first monthly drought outlook from NOAAÃ¢â‚¬â„¢s Climate Prediction Center recently warned that drought in the U.S. Southwest is exceptionally intense and unlikely to break completely, despite some relief from the summer thunderstorm season. 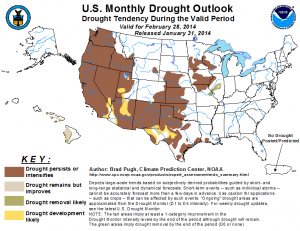 Most of the already parched West will likely see drought persist or worsen, NOAA said. Meanwhile, the Wall Street Journal reports that overgrown forest land poses fire risk to a growing number of communities. It cites U.S. Forest Service statistics that 65 million to 82 million of National Forest lands are at a Ã¢â‚¬Å“high or very high risk of fireÃ¢â‚¬  and are in need of restoration. Between 1960 and 1970, there was only one year, 1969, when wildfires burned more than five million acres in the U.S. In the last decade, it happened eight out of 10 years, the WSJ adds. As of July 1, some 11 wildfire, heat and drought events have resulted in an estimated $365 million in insured losses in 2013, according to Munich Re. AonÃ¢â‚¬â„¢s June Global Catastrophe Recap notes that the Black Forest Fire near Colorado Springs became the most damaging fire in ColoradoÃ¢â‚¬â„¢s history and left two dead. The fire charred 14,280 acres of land and destroyed at least 511 homes. Insurers received at least 4,500 claims with payouts in excess of $350 million. Due to dozens of destroyed uninsured or underinsured homes, the overall economic loss will approach $500 million, Aon added. On June 30, 19 firefighters were killed while working to contain the Yarnell Hill Fire in Arizona. This is the deadliest event for firefighters since 9/11 and the third highest firefighter death toll attributed to wildfires. More information is available via Insurance Information Institute (I.I.I.) facts and statistics on wildland fires and droughts and heat waves.